A post I’ve been dying to share and what I know some have you have been dying to see, a first peek inside my home. Although, I’m not giving away too much just yet as I feel like I have so much left to do and buy first, but I’m enjoying the long process of making it my home bit by bit. I now find myself rushing to nab a bargain at the 40% La Redoute Home Sale, getting excited over Lidl Spanish food week and going to B & Q on a Sunday to purchase a bathroom wall hook, I hate who I have become. I am my parents. This is definitely not what I bargained for when I signed my life away to a 25 year mortgage but I secretly like it, shhhh. 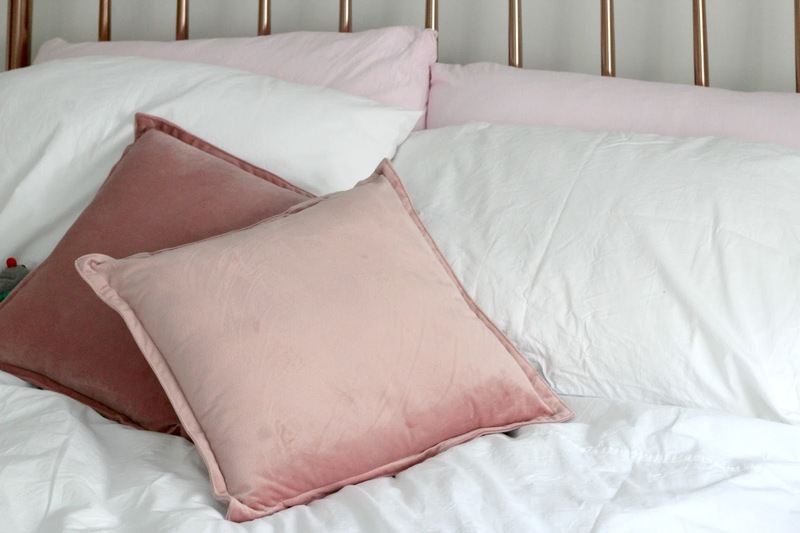 I’m still ticking off a list as long as my arm for things I want to buy, but for now here’s a little sneak peek inside my home, as you’ll see, barely any pastel pink, copper, or white in sight ;)…. My bedroom is slowly becoming my ultimate haven. I don’t know myself now I have both a double bed and a room bigger than a box, it’s amazing! I really want to make this room a little retreat where I can come and relax at the end of the day. The walls are still very bare, and the decor is very minimal and white. 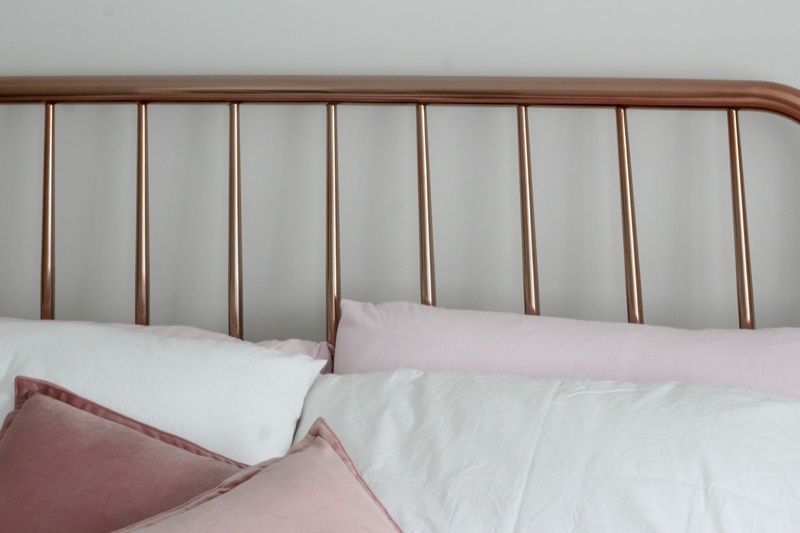 The high windows make the room incredibly light, and I’ve chosen pinks and copper to add some warm pops of colour to the room. I still have a few things on my list to add to this room. My favourite purchase so far? 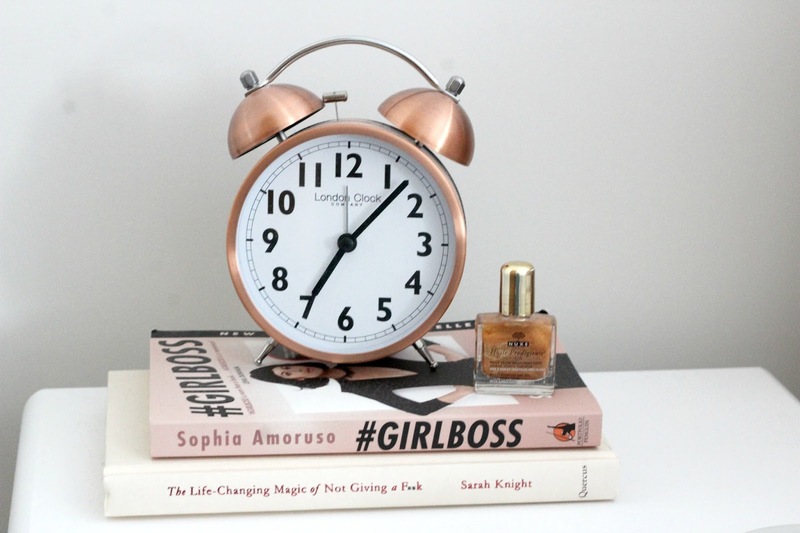 Without a doubt the Oliver Bonas lamp! It matches my bed frame perfectly and I’ve been on the lookout for something like this for so long. 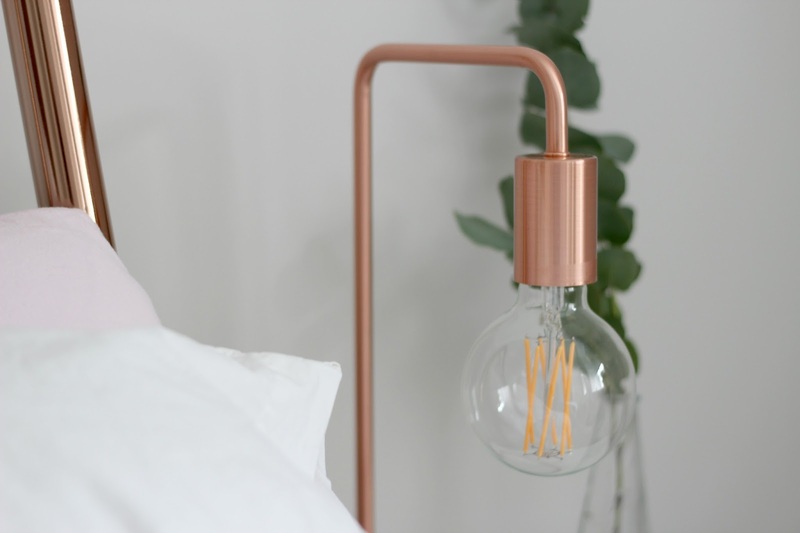 There’s something so quaint but minimal about industrial style lighting. I’ll probably ‘rarely’ use the lamp itself, but it looks great right? The comfiest bed ever!! I have an endless love affair with my bed every morning and it’s getting ever more difficult to get up in the morning. I think my little PG Tip monkey likes it too! I was worried Primark bed sheets wouldn’t give that hotel quality and feel, but I’ve been so impressed with them and they make a perfect background for flatlays! 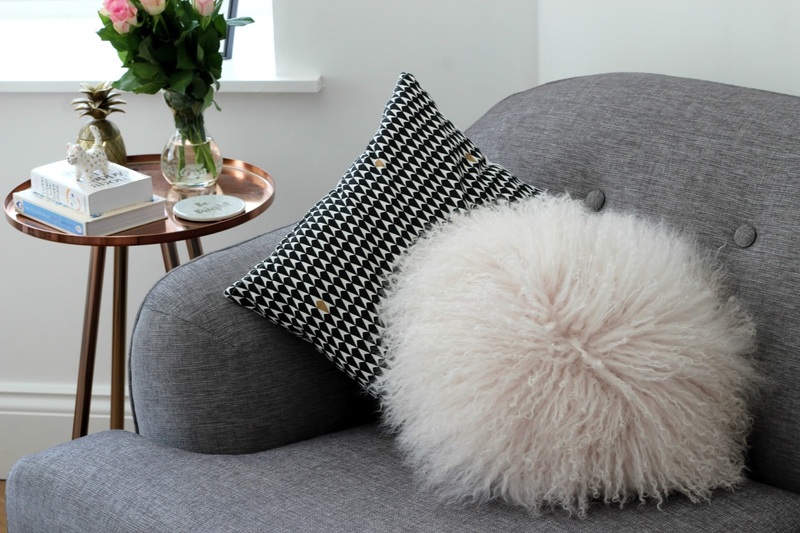 I’m on the lookout for one more cushion to join and a throw before my bedding is complete. You can thank Pinterest for this little creation which I lurrrvvve!! 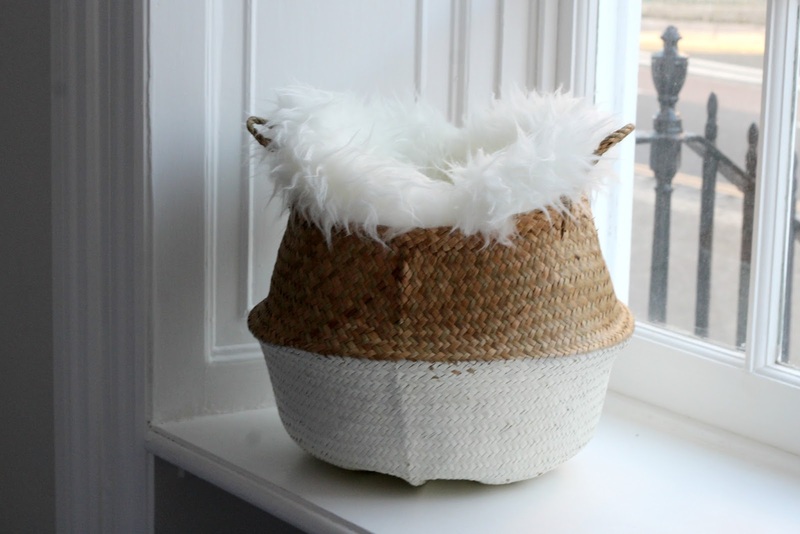 Makes a great talking point when people come over too, in my boyfriends words ‘what’s that?’ – ‘well it’s a basket with a rug inside, DUH’. I can see my apartment slowly becoming overrun with wicker baskets though, sorry not sorry. 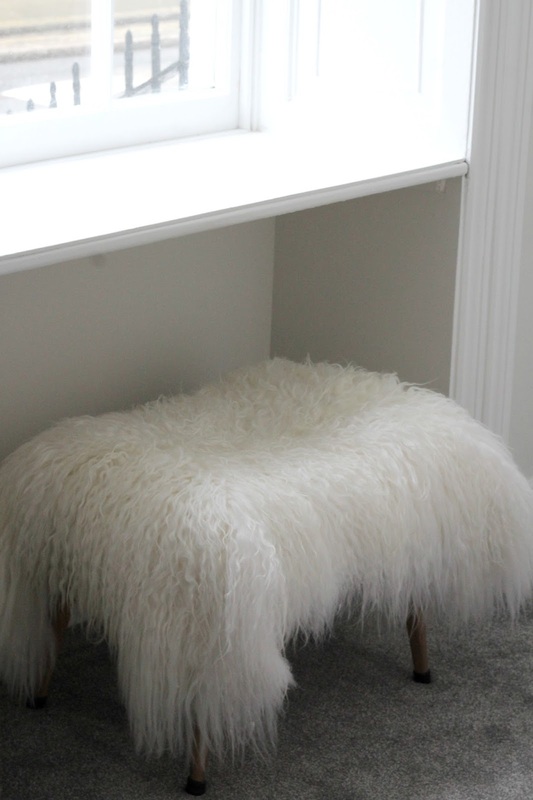 Still smitten with my DIY mongolian fur stool which I posted about earlier this year. It’s the softest most comfortable stool and it looks fab underneath the high windows. 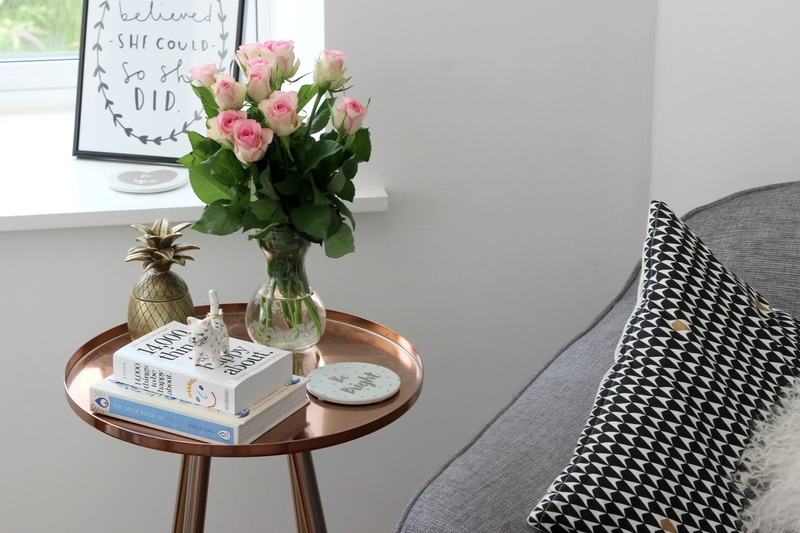 Bedside table styling is harder than it looks and I’m constantly pinning to my home details board with more inspo! 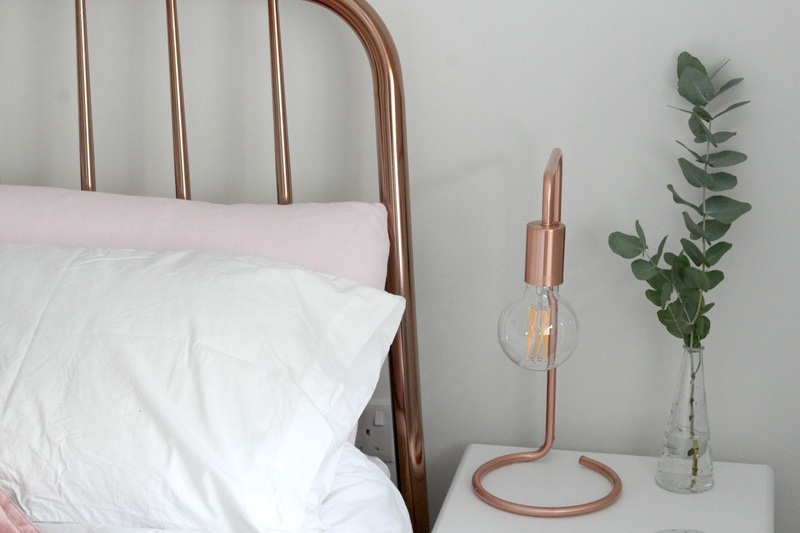 I’m still learning what I like best, but this copper clock perfectly blends in with the bed frame and I like how each bedside table has a completely different look, I personally don’t like the ‘show home’ look. Love! This sofa setup is SO me and I feel warm inside every time I come home to it, mission accomplished. I’m just waiting for my new pink gal from Made to arrive now and the living setup will nearly be complete. CANNOT WAIT. Oh, there’s a surprise, another piece of furniture from Made. I bought this copper table full of optimism back in December when I though I would be moving in January. It was the first item I setup when I moved in, and I just love it so much. 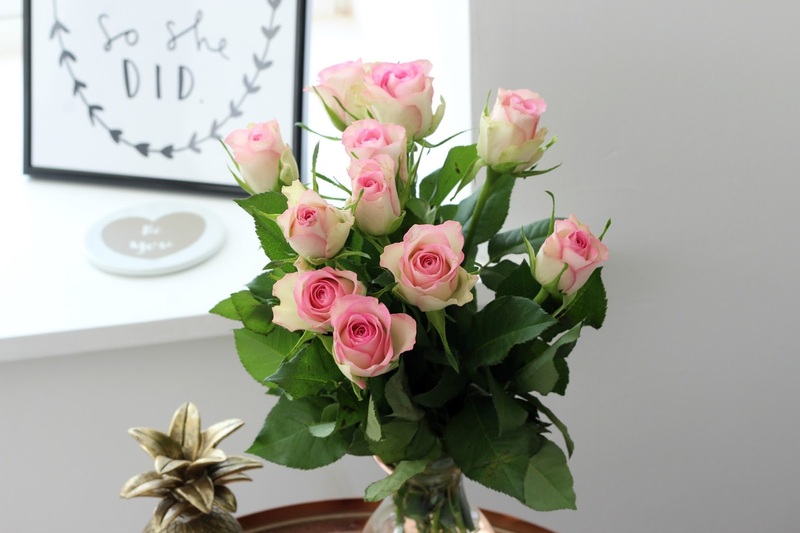 It’s the perfect table for styling, and fresh flowers every week to add to the top is a must. I splurged and finally caved in on the Diptyque hype, but how could I not when it looks this pretty. This and my bunny eared cactus from Ikea make the perfect pair. Hmm, I wonder how long this print will stay on the floor waiting to be hung up? But I don’t really mind when it looks this cute, this was another Pinterest inspired find which took me agggess to track down. 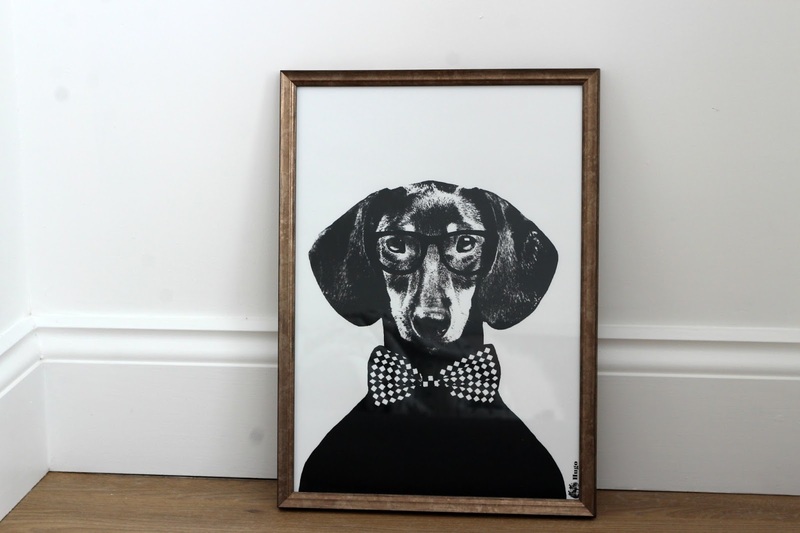 I just need a real life Dachshund to fulfil my dreams now. It’s that La Redoute rug <3 The one that even has it’s very own Instagram account to document its beauty, the love for this is real. It’s so cosy on my tootsies too! I have the perfect Ikea table for my kitchen area, it’s mostly just me eating here so I can keep it as minimal as possible. My friend picked me up this little fake plant for a moving in gift and it literally couldn’t be more perfect. I have a penchant for The Old English Company’s prints and coasters too, Buy Me Pizza and tell me I’m pretty is literally me. Ending the post in my Kitchen, here’s just a couple details that are currently sitting on my sides. I have a cream theme going on with the kettle and toaster so the mint teapot contrasts perfectly with it giving it an almost retro theme. I think I’ll be very happy here, and I’m loving making my apartment my own. 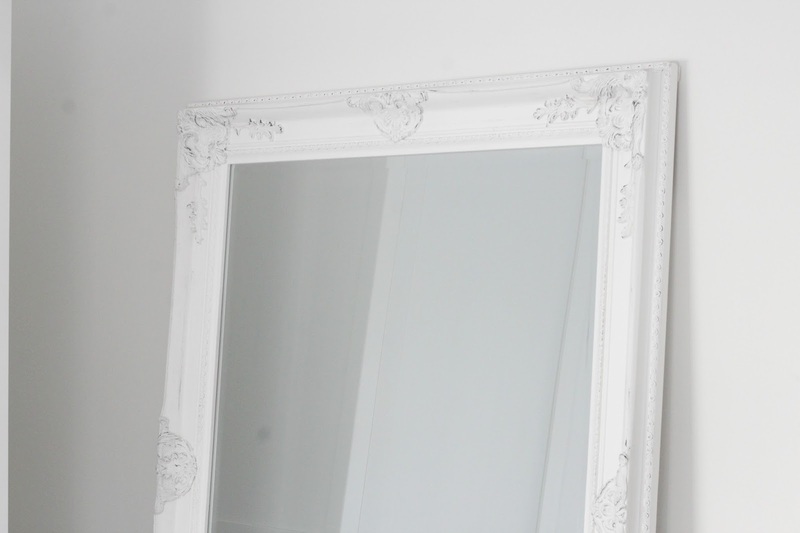 Keep an eye out for a more in-depth peek inside my home very soon! What do you think of my home details? Can you spot anything you’d like? 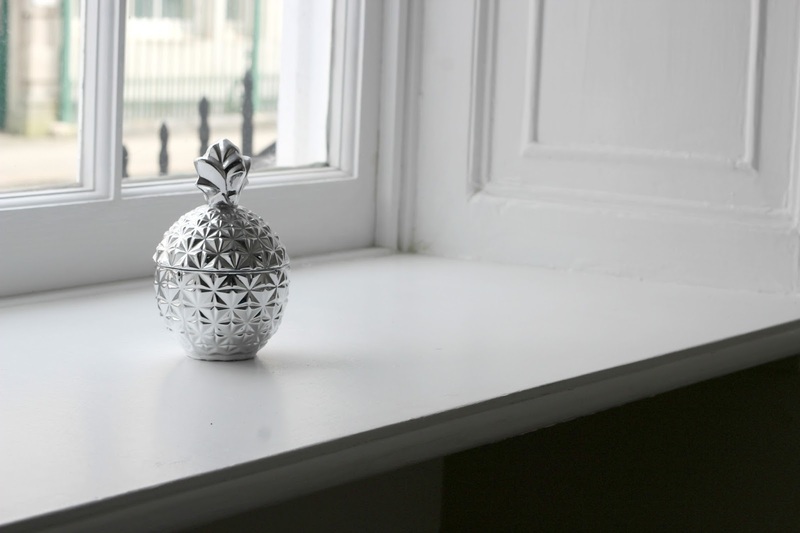 Do you love homeware shopping too?